Rugby runs in Billy Vunipola's blood. His father Fe'ao captained Tonga in the 1990s when several uncles also represented the national side. His cousin Toby stars for Wales, while Vunipola and his brother Mako are standout players for England. But that hasn't always made things easy, particularly during his early years. Born in Sydney, raised in Wales and then England when the family relocated to the UK -- Fe'ao had signed to play for Pontypool -- the imposing number eight Billy describes his itinerant upbringing as "frantic," adding, "we were never settled anywhere until we came to England." Britain proved something of a culture shock. "When we started setting up roots here, it was tough," says Vunipola. "I remember our first few months in Wales we all just slept in the living room because we were used to being around each other. We just had duvets all over the floor." It's an endearing image and one that's difficult to picture today. Vunipola tips the scales at 130 kg. He's a bulldozer with the ball in hand, but has honed his game in recent years to develop defensive nous and subtle handling skills. Brother Mako, meanwhile, two years Billy's senior, is 9 kg lighter but equally adept in open play, eschewing the logic that prop forwards are supposed to focus solely on scrummaging. Both will feature prominently in England's upcoming Six Nation campaign, which gets underway in Dublin against Ireland on February 2, with Vunipola having recently returned from a long injury layoff that saw him suffer three arm breaks. "My name's on the sheet but I want to be back back," he says. "I want to be playing and I want to be playing well. "I'm lucky that I only had to deal with broken arms, you know. I can still walk and I can still play rugby. It just took time out. It wasn't fun but I'm happy, I'm playing rugby and hopefully I can carry on. "The Six Nations is probably the premier tournament outside the World Cup in terms of rugby, I would say, and in terms of viewership. The rugby that's been played, the unpredictability of the whole tournament, just as a fan it's exciting. As a player it's even more exciting." After a disappointing fifth-place finish in last year's tournament -- for which Vunipola was absent through injury -- Eddie Jones' England side will be hoping for a much-improved Six Nations campaign with a World Cup on the horizon, and Vunipola's return should give confidence in that regard. Since making his international debut in 2013, he's been a leading light in an England team that's endured unprecedented high and record lows, as well as helping his club side Saracens amass silverware on domestic and European fronts. A rugby career, he says, always seemed inevitable. "I remember growing up and my dad trying to push us in the direction of being doctors or lawyers or anything he thought was a good job," says Vunipola. "I'm not saying he was right or wrong but me and my brother always wanted to play rugby. We got our wish." The seed was sown when the brothers started to wrestle with a rugby ball in their living room in Wales or played mini games with their cousins outdoors. "Mako would be with Toby, who's now at Bath, and I would be with Toby's brother," recalls Vunipola. "Every single time we played it was always me and Mako that had a fight. "I was always the youngest of the four of us. They'd both hate it if I actually got a successful tackle on them. He'd usually start [the fights] and finish them, but I knew that I was getting under his skin when I'd tackle him or score a try." That rivalry has mellowed now, with Vunipola even admitting that his brother is the superior player: "He's probably just a smaller, better, stronger version of me," he says. Humility is something Vunipola has acquired over time. He says that his rise to the top of the game -- via a scholarship at prestigious English public school Harrow and the Wasps academy -- gave him undue self-confidence. "If you keep hearing your name I guess subconsciously you just think you're the man and that's what I did. I thought I was more important than I actually was. "I love seeing some of the young boys here at the club. You go in 50% and they go 100% and you get angry at them, but they do what's right. I've actually learned a lot from the younger guys coming in." 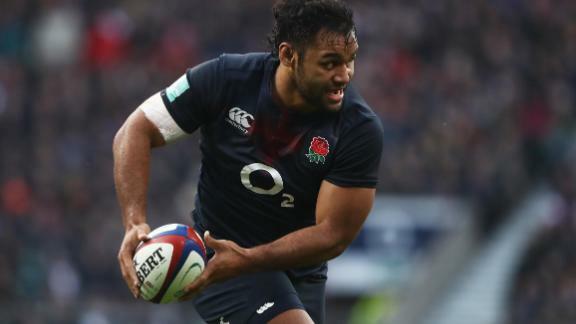 While his initial focus is having an injury-free run of games through the Six Nations, Vunipola admits that his thoughts can't help but gravitate towards the World Cup in Japan later this year. He was part of the England team that crashed out at the pool stages in 2015 -- the first host nation ever to do so -- and will be eager to right some wrongs in Japan. "This is what you kind of prepare your whole life for," he says, "I guess I didn't understand that in 2015." "We've got a Six Nations coming up, but, you know, it's something you can't be afraid to talk about. It's the World Cup, it's massively exciting. It's going to be a massive year for everyone." England's opening match of the tournament -- against Tonga -- will divide the Vunipola household. Fe'ao won 32 caps for the South Pacific island and today works for the Tonga Rugby Union. "I guess we're his sons and he'll want us to do well but you know deep down inside he wants Tonga to secretly get one over England," says Vunipola. "I know my mom will 100% be behind us and the rest of my family but my Dad will be a bit torn." Born in Australia, raised in the UK and crowned world champion in Japan? Vunipola's story would enter another thrilling chapter if England were to defy the odds and lift the World Cup. "The thing is I'm one of millions of people that think about winning in Japan and I guess I'm one of the millions that aren't scared to talk about it," he says. "All these cliché things that you can sit here and say in an interview is correct for right now. It's a dream."